8 year/s ago 1315 Visit WebsiteDentistryBroken link? 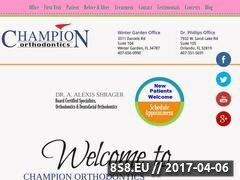 At Champion Orthodontics, an Orlando Orthodontist, they recognize that every patient has different needs. If you are an adult, adolescent or child, their caring and knowledgeable doctors and staff are committed to helping you achieve the smile you deserve - a healthy, beautiful one. Call their Orlando Orthodontist office to schedule an appointment today. Ghauri Dental Centre Ghauri Dental Centre is a long established practice offering dental services to patients throughout London. The surgery, which is located in Shepherds Bush (London).